Did you know that you can switch and use electricity generated by a renewable energy supplier that uses wind, solar and even "cow power," helping to replace the need for dirty fossil fuels and earning tax deductions at the same time? That's just one of many ways you will learn about how you can make your life GREENER when you complete the Green Committee's GREEN Pledge for Earth Week. 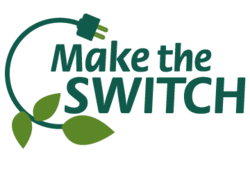 Click on the words "Make the Switch" below the "Make the Switch" logo to be taken to the form. Complete the GREEN Pledge online and find out how to make some GREEN improvements in your life before Earth Week 2016 rolls around. You also might win a gift card to a Back Bay hotel, restaurant, or another exciting prize!! The deadline is (naturally) the end of Earth Month, April 30, 2016. NABB is aiming for 100 pledges completed; 250 would be impressive, & 500 responses would be over the top.